Tomorrow Jesus returns to the Earth to take everyone out of Saturday Mass and into the Kingdom of Heaven. The rest of us will have to endure-in strict chronological order-war, famine, death, martyrs crying out for vengeance, earthquakes, natural disasters, enough hail and fire to destroy a third of the world’s trees and grass and sky, the poisoning of rivers and springs, a five month plague of locusts, and then whatever third of the population remains will be killed by an army of 200 million angels. Afterwards, the seas will turn to blood, the sun will scorch the earth before turning off entirely and committing the world to total darkness, and another earthquake. 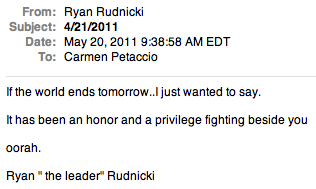 If confused, see this illuminating dispatch from BPoFD‘s resident theologian Ryan Rudnicki below.